^ a b Bertrand Meyer: UML: The Positive Spin, in American Programmer , 1997. Ambler, Scott William (2004年). The Object Primer: Agile Model Driven Development with UML 2. Cambridge University Press. ISBN 0-521-54018-6. http://www.ambysoft.com/books/theObjectPrimer.html. Chonoles, Michael Jesse; James A. Schardt (2003年). 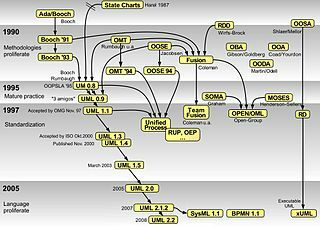 UML 2 for Dummies. Wiley Publishing. ISBN 0-7645-2614-6. Coad, Peter; Eric Lefebvre; Jeff De Luca (1999年). Java Modeling In Color With UML: Enterprise Components and Process. Prentice Hall. ISBN 0-13-011510-X. Fowler, Martin. UML Distilled: A Brief Guide to the Standard Object Modeling Language (3rd ed. ed.). Addison-Wesley. ISBN 0-321-19368-7. Jacobson, Ivar; Booch, Grady; Rumbaugh, James (1998年). The Unified Software Development Process. Addison Wesley Longman. ISBN 0-201-57169-2. Martin, Robert Cecil (2003年). UML for Java Programmers. Prentice Hall. ISBN 0-13-142848-9. Penker, Magnus; Hans-Erik Eriksson (2000年). Business Modeling with UML. John Wiley & Sons. ISBN 0-471-29551-5. Henderson Sellers, Brian (2006年). about UML profiles. Springer Verlag. MoDELS'2006 Conference, Genova.